The Twitterverse moves fast. It’s a world that measures time in seconds versus hours. Nonetheless, important things are constantly happening, and interesting trends are always emerging that can be missed in the blink of an eye (or a busy Twitter-less day on the job). So each week, stay in the loop and take a look at the Twitter Week in Review chart that we publish in partnership with Ad Age. The top terms and hashtags from the past week are highlighted, and reveal some major things that people all over the world were talking about in the recent past. Last week’s chart is right over here. So what were some reasons behind these trends last week? This week’s Trends of the Week felt representative of the Twitterverse with a mix of pop culture, tech, business news and global events. For additional Trend definitions, check out Ad Age’s article and at What the Trend, a HootSuite company. American singer, Andy Williams was trending last week when news of his death was reported. The ‘Moon River’ crooner was diagnosed with bladder cancer in 2011. In stark contrast to Día Internacional de la Paz or International Day of Peace which was also trending this week, September 25 2012 saw protestors clashing with police near Parliament in Madrid, Spain. More than 1000 officers were out on the streets as demonstrators protested the proposed European Austerity policies. Images of the violent protest were wide spread via television coverage and social media. The release of Google Maps underwater street views. Apple CEO Tim Cook suggesting consumers try non-Apple map apps. 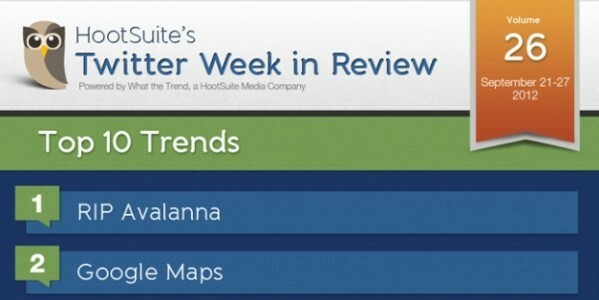 Help HootSuite’s What the Trend define trends by following @whatthetrend.